NASA tweeted this image of the Spirit rover. A decade ago, NASA’s Spirit rover landed on Mars – fueling the curiosity of schoolchildren and setting in motion the public’s insatiable thirst for all things red planet. Now a nonprofit is talking human colonization and pictures of the rocky terrain go viral. But in its retrospective of the event, NASA recounts how it planned for Spirit and its twin, Opportunity (which landed three weeks later), to last for three months. Spirit worked for six years. Opportunity is still exploring. 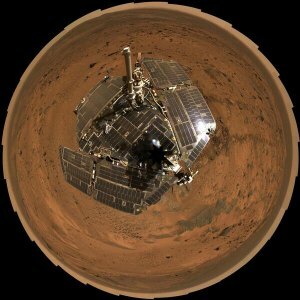 Both rovers succeeded in the main goal of finding evidence for ancient watery environments on Mars. Spirit was sent to a crater where the basin's shape and apparent inflow channels seen from orbit suggested a lake once existed. Opportunity's landing area, almost exactly halfway around the planet, was selected mainly on the basis of a water-clue mineral detected from orbit, rather than land-form shapes. Spirit's destination did not pan out initially. The crater may have held a lake, but if there are any lake-bed sediments, they are buried under later volcanic deposits. Opportunity landed a stone's throw from an exposure of layered rock that within weeks yielded compositional and textural evidence of a water-rich ancient environment. Within the initial three-month missions and without expectation of surviving a full year, each rover set out cross-country toward other destinations: hills on the horizon for Spirit and craters exposing deeper layers for Opportunity. Spirit drove a total of 4.8 miles (7.7 kilometers) some of that with one of its six wheels not rotating. Loss of use of a second wheel while the rover was in a sand trap contributed to the 2010 end of that mission. Opportunity has driven 24 miles (38.7 kilometers) and is still going strong. One key to Spirit and Opportunity working for years, instead of a few months, has been winds that occasionally remove some of the dust accumulating on solar panels that generate the rovers' electricity. Also, the ground crew became adept at managing each rover's power consumption and taking advantage of slopes for favorably tilting the rovers toward the sun during Martian winters. "Ultimately, it's not only how long the rovers work or how far they drive that's most important, but how much exploration and scientific discovery these missions have accomplished," said John Callas, project manager for NASA's Mars Exploration Rover Project, who has worked on the Spirit and Opportunity missions for more than 13 years. By driving to outcrops miles from their landing sites, both rovers reached evidence about multiple episodes of Martian history, "traveling across time as well as across Martian terrain," he said. Opportunity is currently exploring outcrops on the rim of Endeavour Crater, which is 14 miles (22 kilometers) in diameter. "Opportunity is still in excellent health for a vehicle of its age," Callas said. "The biggest science may still be ahead of us, even after 10 years of exploration." The science achievements have already provided major advances in our understanding of Mars. "In the Columbia Hills, we discovered compelling evidence of an ancient Mars that was a hot, wet, violent place, with volcanic explosions, hydrothermal activity, steam vents -- nothing like Mars today. "At Opportunity's landing site, we found evidence of an early Mars that had acidic groundwater that sometimes reached the surface and evaporated away, leaving salts behind. It was an environment with liquid water, but very different from the environment that Spirit told us about. "When Opportunity got to the rim of Endeavour Crater, we began a whole new mission. We found gypsum veins and a rich concentration of clay minerals. The clay minerals tell us about water chemistry that was neutral, instead of acidic -- more favorable for microbial life, if any ever began on Mars." The Mars Exploration Rover Project is one element in NASA's efforts to prepare for human missions there by the 2030s. The Mars Odyssey and Mars Reconnaissance Orbiter missions have been studying the red planet since arriving there in 2001 and 2006, respectively. NASA's next-generation Mars rover, Curiosity, is examining an area that once offered conditions favorable for microbial life. NASA launched the Mars Atmosphere and Volatile Evolution, or MAVEN, mission two months ago, to begin orbiting in September 2014. The agency plans to launch a mission to Mars in 2016 called Interior Exploration using Seismic Investigations, Geodesy and Heat Transport, or InSight, to learn about the deep interior of Mars. A Curiosity-size rover planned for launch in 2020 has the task of checking for evidence of past life on Mars.